WITH thousands of boxing fans assembled on the grounds of the Boxing Hall of Fame Museum and blue skies overhead the newest members of the International Boxing Hall of Fame became boxing immortals during the Official Induction Ceremony held on Sunday, June 9th. This year's living inductees were Mexico's Pipino Cuevas, Australia's Jeff Fenech and Britain's Reg Gutteridge and Sweden's Ingemar Johansson. Living honorees receive the official Hall of Fame Induction certificate and gold Hall of Fame ring symbolizing their status as Hall of Famers. Speaking through an interpreter, Cuevas said, "A boxing career is one of many sacrifices. I believe it is worth all the sacrifices to be here today. I am happier today than when I won the world championship." Upon induction into the Hall of Fame Fenech said, "It's a very emotional day, especially to have my trainer, Johnny Lewis, with me. If it wasn't for him, I wouldn't be here today...This award is the peak of my boxing career. You can't get any better." The 13th annual induction ceremony of the boxing hall of fame in Canastota, New York had a distinct international flavor with the living inductees hailing from Australia (Fenech), Mexico (Cuevas), Sweden (Johansson) and England (Gutteridge). The weekend's special guests also came from far and wide with the likes of Nino Benvenuti (Italy), Sir Henry Cooper (England), Ruben Olivares (Mexico), Mickey Duff (England) and Alexis Arguello (Nicaragua) on hand in Canastota. Johansson, who won the heavyweight title in 1959, was unable to attend due to poor health. The posthumous inductees of the Class of 2002 were Victor Galindez from the modern era, Benny Bass, The Dixie Kid, Sixto Escobar, Harry Harris and Owen Moran in the old-timers category, Charley Mitchell, Young Dutch Sam and John C. Heenan in the pioneers category, Irving Cohen, Aileen Eaton and Sam Silverman as non-participants and Damon Runyon and Jimmy Cannon as observers. Among the boxing stars on hand for the weekend were Hall of Fame Alumni: Carmen Basilio, Carlos Ortiz, Aaron Pryor, Jose Torres, Emile Griffith, Ruben Olivares, Gene Fullmer, Ken Norton, Alexis Arguello, Kid Gavilan, Ken Buchanan, Lou Duva, Jose Napoles, Mickey Duff, Matthew Saad Muhammad, Marvelous Marvin Hagler, Angelo Dundee, Nino Benvenuti, George Benton, Gil Clancy, Don Chargin and Ralph Citro. Past or present world champions in attendance included Tony DeMarco, "Jesse" James Leija, Jimmy Ellis, Terry Norris, Vito Antuofermo, Leon Spinks, Marlon Starling, Simon Brown, Ernie Terrell, Juan LaPorte, Paulie Ayala and Christy Martin. The total numbers of past or present champion in attendance was 27. Other notable fighters in Canastota for the weekend were Gasper Ortega, Earnie Shavers, George Chuvalo, Sir Henry Cooper, Gerry Cooney, Ron Lyle, Micky Ward and Joe Miceli. The Hall of Fame Weekend featured over 20 exciting events including a golf tournament, banquet of champions, boxing autograph card show professional boxing show, parade of champions and a host of activities on the Museum Grounds, including workouts by boxing's top stars. This year's Grand Marshals of the Hall of Fame Parade of Champions were the New York police (NYPD) and fire departments (FDNY). Ron McNair of the NYPD and Tom Orlando of the FDNY represented both departments. Cuevas becomes the seventh Mexican fighter inducted, joining Jose Napoles, Ruben Olivares, Sugar Ramos, Salvador Sanchez, Miguel Canto and Carlos Zarate. Promoter Aileen Eaton is the first woman to be inducted. 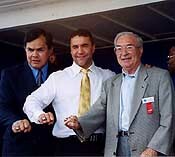 Living inductees from the Class of '02, Pipino Cuevas, Jeff Fenech and Reg Gutteridge on Induction Sunday. 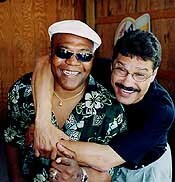 Hall of Fame alumni and former rivals Alexis Arguello and Aaron Pryor reunite in Canastota over induction weekend.